Another of those fun and quirky January issues with some really rare material. First, visit the secrets of the UFO encounters with The Invaders playset. Its official, and never before seen. Then try to figure out where that mystery Jeep -- by Marx -- is from! We also delve into the Golden Astronauts, and then take an abrupt turn to Louis' Generals -to satisfy those with a taste for the rare and unusual (did we say quirky?) - its Louis' Generals! Combining a rare Louis Marx figure and Chinese, Cuban, Russian Nazi and "other!! Generals). This has got to be some of the most fun and colorful character figures you'll ever come across! Is that all? Heck no! But we're so busy getting this issue out you'll have to wait a bit for more. We promise to do our part in keeping the hobby alive and well with the only magazine devoted to plastics and vintage toys from the Atomic Age and Beyond! We cant wait for you to join us. 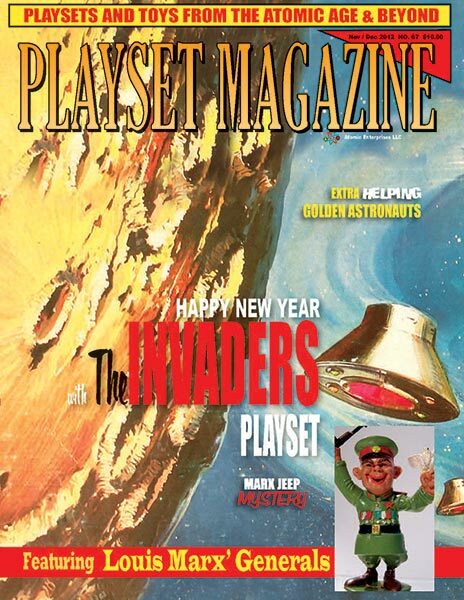 Merry Christmas everyone, and thanks for your interest in Playset Magazine.